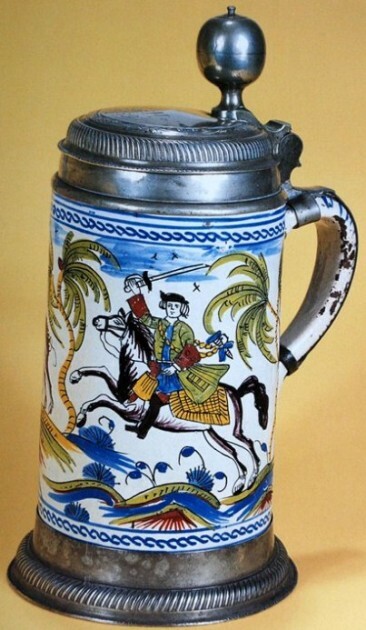 Identifying Faience Steins (Part 1) – Comparisons of North German / South German. This is the first in a series of articles that will discuss identifying faience factories. Although I have written several articles in the past, when it comes to identifying faience steins, this is the article I should have written before the articles about specific factories (Poppelsdorf Faience in March 2009 and Magdeburg Faience Factory in September 2006) [Steve’s note: Those two are published in “Prosit” (SCI’s magazine) not on this website. Also this article first appeared in PROSIT under the title: “Identifying Faience Steins . 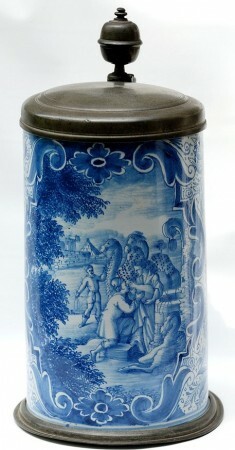 Part 1- North versus South German.”] Subsequent articles will discuss specific faience factories. 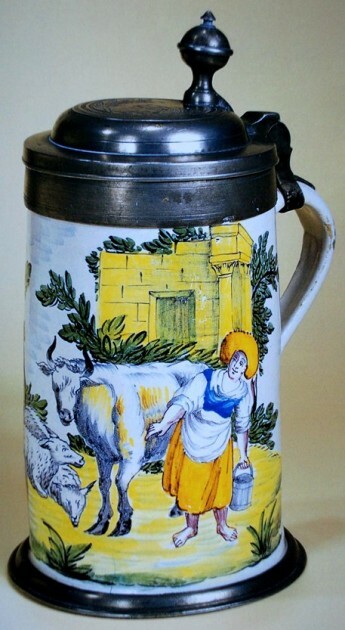 First, let me give you a little background on faience steins. 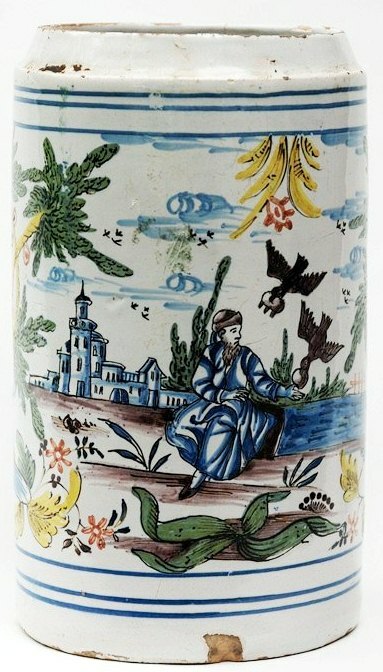 Faience factories were always located near wood and clay, the two most important ingredients for production. Once the factory established a workable clay recipe, a thrower then made a basic shape. 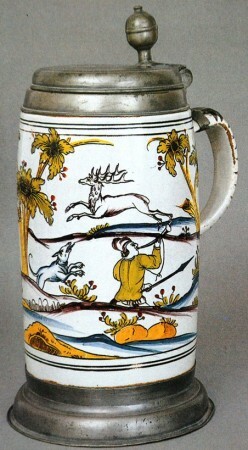 For steins, that shape is the straight sided tankard (walzenkrug), the pear-shaped stein (birnkrug), or the narrow-necked jug (enghalskrug). The piece was then let dry until leather hard. The handle was attached and the piece received its first firing to about 700˚C. This drove off the water and left a hard porous body. After the first firing, the stein was dipped in a tin oxide glaze (tin oxide, powdered glass, and a flux). 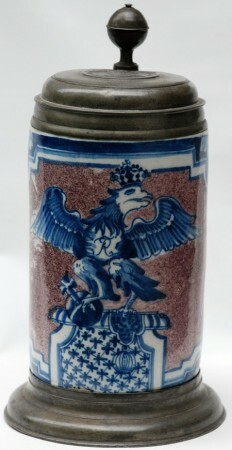 Most factories then decorated the stein with high temperature pigments (cobalt blue, antimony yellow, copper green, manganese violet, and iron red). The stein then received its second firing to about 1000˚C. This second firing melted the tin glaze and the pigments into a smooth porcelain type finish. 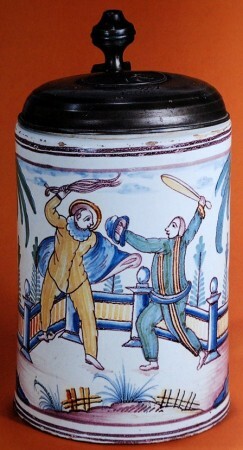 Most of the faience steins were produced this way (see article Faience Artist in December 2007 where there is a discussion about muffle fired faience). When identifying faience steins, they can be broken down into two major categories: North Germany and South Germany. These two regions produced different style steins and had different techniques in applying pewter to the steins and these differences can be used to identify a stein as either coming from the north or the south. 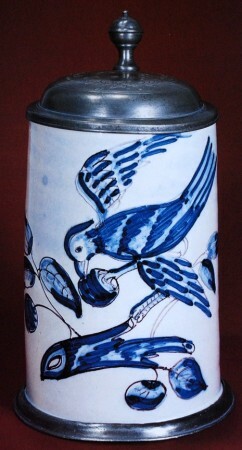 ‘Figure 1’: Shows a typical stein produced in the north (it features a stein without pewter work to better show the stein body.) 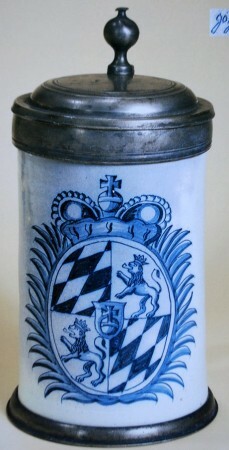 The bottom of the stein has straight sides and the top is indented. 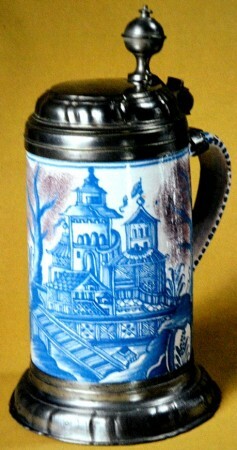 ‘Figure 2’: Is of a stein with typical pewter work. 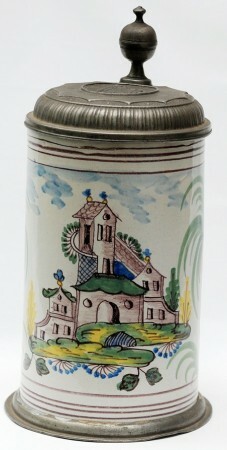 The top of the stein has a lid ring which fits around the indentation at the top of the stein body along with a lid. 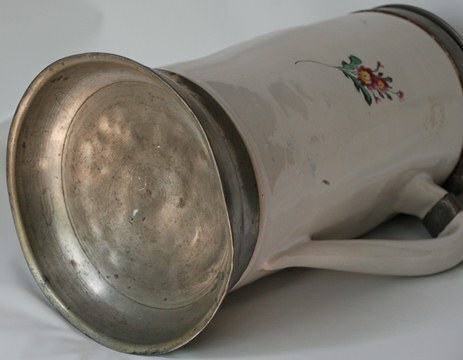 The pewter base is straight at the sides and it usually has a full pewter base under neither, which would cover up any markings on the bottom of the stein. 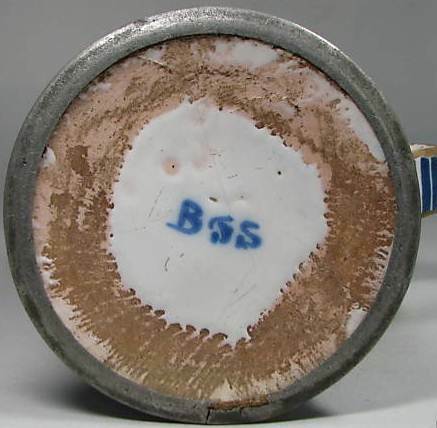 This is another reason why identifying faience can be difficult when the base pewter work covers up any markings that may be on the bottom of the stein itself. ‘Figure 3’: Shows the bottom of a typical pewter base. 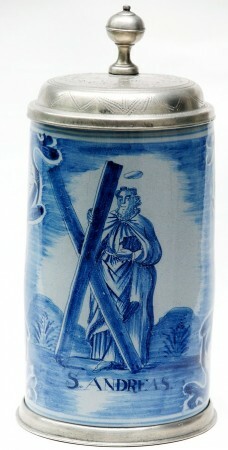 The lid ring and the pewter base are attached to the stein using pitch. Over time this will dry out and do to the straight side design at the bottom of the stein body, the pewter base will come loose and is often missing. 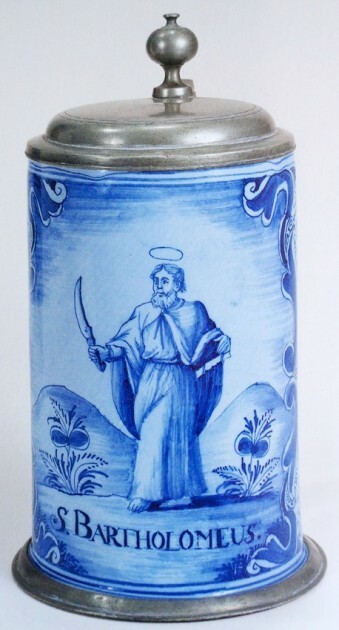 So, by looking at the stein design and the pewter work you can identify whether a faience stein is from the north or the south, but now the hard part begins in trying to identify the individual factories. 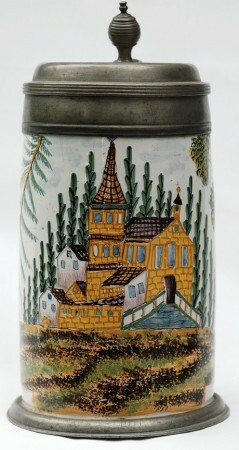 In the next several articles I will discuss specific factories and give you help in identifying their steins. I will address the factories that I have studied and identify specific decoration traits that I have noticed. There should be another 6-10 parts to this series and I hope to have one article in each of the next few “PROSIT” (and “Steveonsteins” until finished. There are two charts within this article that list the NORTH GERMAN and the SOUTH GERMAN factories. The charts list the factories and their manufacturing dates, pewter base design, and the number of steins that I have in my faience stein database. I have been tracking faience stein that come up in auctions both in the USA and Germany as well as eBay, going back to the mid “90s. 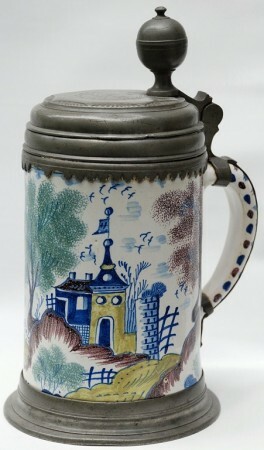 Currently there are over 8100 steins in my database, which includes delft and Austrian faience. So the factory numbers will give you an idea of how rare a particular factory may be. and FFR – flared foot ring. FFR – flared foot ring. S1 – Ansbach. S2 – Bayreuth. S3 – Nuremberg S4 – Nuremberg.